I have been a keen user of balanced aerials fed with open wire feeder in order to get the RF power to the aerial with the minimum of loss and to minimise RF in the shack. Experiments started with a classic G5RV and a 10W input power transmitter and rapidly moved on to open wire feeders instead of coaxial cable with instant improvements in contact rates and signal reports. To address 1.8MHz, loading coils and extra end sections were initially tried with some improvements over the basic G5RV. The original idea for the aerial shown above was found in articles in QEX & CQ magazines and has been further developed for the current location. The length of the top started at 132 feet and has been adjusted to obtain a resonance on 1.84MHz with the stubs in place and this will change with aerial height and location - it is now 125 feet overall. The stubs exhibit an extremely high Q, have little or no effect on bands where they are resonant in odd multiples of a quarter wavelength and increase the overall electrical length of the aerial on all other bands. A Z-Match or other balanced output ATU is required. Results: Worked W/VE/VO on 1.8MHz with 100W CW and Italy on 50MHz with 3W SSB. 1.8 and 3.5MHz are much better than both the original G5RV and the inductor loaded G5RV although directivity is quite pronounced - predominantly broadside - the radiation angle will depend on the height above ground. All higher frequency bands are at least as good as the original G5RV with open wire feeders. 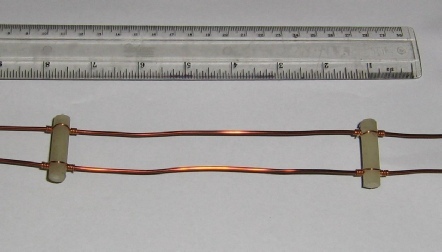 The open wire feeders and the two stubs are made of 16SWG (1/16 inch or 1.6mm diameter) enamelled copper wires spaced 0.90 inch apart with insulators approximately 5 - 6 inches apart. The insulators should be UV resistant for maximum length of life in high sunlight locations. The aerial can also be loaded up on 50, 70 and 144MHz with an appropriate ATU (a VHF Z-Match is fairly easy to construct). A 50Mhz half wave dipole has been added so that more of the radiation occurs from the broadside rather than the ends on the 50 - 146Mhz bands. 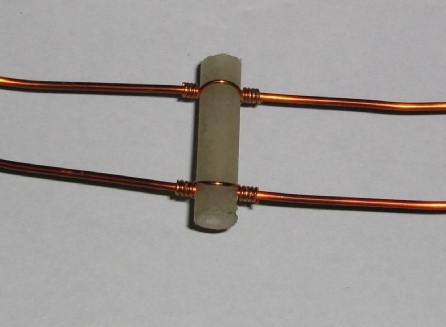 This additional dipole has been cut for the low end of the 6m band and is supported on the main dipole using the same insulators and binding wires that are used for the feeders. The original polythene insulators lasted some 5 years before becoming brittle from UV exposure. They have now been replaced with 8mm diameter acrylic rod insulators which should last rather longer. A half size version would work well down to 3.5MHz with an overall length top of 66 feet and stubs of 16 feet 6 inches in length and at least one UK station is known to be using this format. All in all a good multiband aerial. Future ideas for development: traps or stubs to broaden the radiation pattern on VHF and a prototype Z-Match for 70cms. These feeders, used on the above HF aerial, are constructed from 16swg enamelled copper wire for the main conductors, 8mm diameter insulators and 3 inch lengths of 22-26swg copper wire for retaining the insulators in place. The ruler shows metric measurements at the top and imperial measurements at the bottom. The insulators should be made from a material that will tolerate exposure to sunlight and ultra-violet and has low RF losses. The aerial has now been completely refurbished and all polythene insulators have been replaced with new ones made from 8mm diameter acrylic rod. 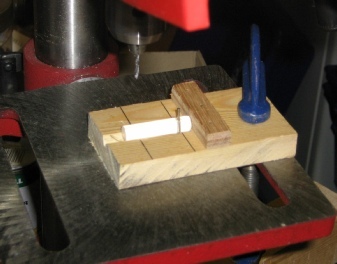 The following photos show the cutting jig on the left and the drilling jig on the right. Note the removable panel pin in the drilling jig used to hold the insulator when drilling the second hole so that it is parallel to the first hole. 1. Cut insulators to size in the cutting jig and cut two binding wires for each insulator - I use a wooden jig to save measuring each one individually. 3. With the guide pin removed from the drilling jig, drill the first hole - for 16SWG wire I use a 0.078inch drill although you may need a larger drill if the wire is badly kinked. Repeat for all insulators. 4. Replace the guide pin, locate the insulator as shown above and drill the second hole. Repeat for all insulators. 5. Acrylic will melt during the drilling process so make sure any build up on the drill is removed otherwise the next insulator will fracture. 6. You may need to clear the drilled holes of any burrs which can be done using a rotating cleaned drill bit. 7. Stretch the feeder wires and apply some tension. Avoid any kinks and you can remove or reduce any bends by running the wires through a thick cloth while tensioned. 8. Release the tension, thread the insulators onto the feeder wires and retension. 9. Space the insulators by about 6 inches (I use another pre-cut wooden jig), wrap the binding wires and gently tighten with smooth jawed pliers - see the upper photos. If you are concerned that the binding wires do not hold the insulators in position, tighten them a little more and you can apply some clear varnish to the turns around the feeder wires. This can be a problem if the binding wires are fairly soft. 10. On completion, release the tension and coil the feeders prior to use.